On the occasion of the Chilean Bicentennial, artists and architects were asked to propose solutions for the 22nd century, anticipating the evolution of Chile’s urban environment. 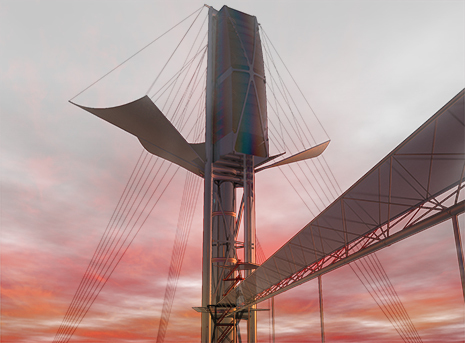 Tschumi’s proposal addresses ecological and economic conditions with a plan to build tunnels and wind towers along a prominent ridge in the middle of the city that separates the city economically and socially. Thanks to six tunnels and vertical airshafts, the proposal uses the mountain to create atmospheric convection, eliminating the air quality problem in Santiago while simultaneously accelerating the transformation of Santiago into a 21st century global city. This convection creates a turbulent boundary layer between the trapped polluted air and the warmer air above, setting meteorological conditions for a daily thunderstorm that cleans and refreshes the air in the Santiago basin. This storm becomes a global icon for the city like the wind in Chicago or the London fog. Simultaneously the tunnels are used as a link between the parts of the city separated by the mountain: some tunnels are filled with educational facilities, some with art, culture and entertainment, some with stopping opportunities. The 6 towers at the top of the mountain will act as a new symbol for Santiago and Chile, suggesting marriage of sustainability and social progress.